What is the CHISQ.INV.RT Function? 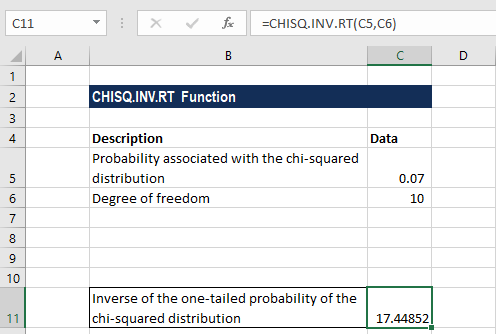 The CHISQ.INV.RT Function is categorized under Statistical functionsFunctionsList of the most important Excel functions for financial analysts. This cheat sheet covers 100s of functions that are critical to know as an Excel analyst. It will calculate the inverse of the right-tailed probability of a chi-square distribution. We use this function to compare observed and expected values. In financial analysisAnalysis of Financial StatementsHow to perform Analysis of Financial Statements. This guide will teach you to perform financial statement analysis of the income statement, balance sheet, and cash flow statement including margins, ratios, growth, liquiditiy, leverage, rates of return and profitability. See examples and step-by-step instruction, the CHISQ.INV.RT function can be used to find out and compare observed and expected values. For example, a genetic experiment might hypothesize that the next generation of plants bearing fruits will exhibit a certain set of taste. By comparing the observed results with the expected ones, we can decide whether our original hypothesis is valid or not. Probability (required argument) – It is the probability of the right-tailed chi-square distribution, for which we want to find the value of x.
Deg_freedom (required argument) – It is the number of degree of freedoms. It must be a positive integer. So, for a supplied probability, the CHISQ.INV.RT function finds the value of x such that CHISQ.DIST.RT(x,degrees_freedom) = probability. Hence, the precision of CHISQ.INV.RT depends on the precision of CHISQ.DIST.RT. 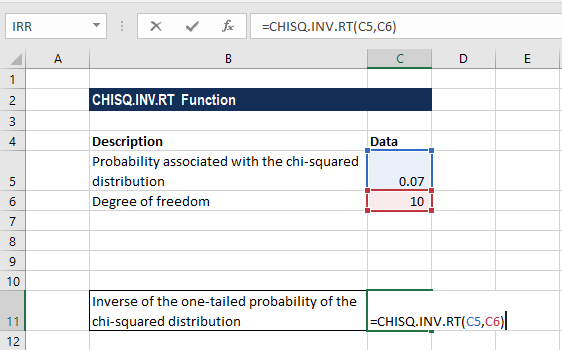 How to use the CHISQ.INV.RT Function in Excel? The CHISQ.INV.RT function belongs to the CHISQ family of functions. The function was introduced in Excel 2010 and hence is unavailable in earlier versions. It is an updated version of the CHIINV function. #VALUE! error – Occurs when any of the arguments provided is non-numeric. Remember, the function will accept only numeric data sets for both arguments and return numeric data. #N/A error – CHISQ.INV.RT uses an iterative search technique. If the search’s not converged after 64 iterations, the function will return this error. The given value of probability is less than or equal to 0 or is greater than 1. The deg_freedom argument is less than 1. CFI is the official provider of the Financial Modeling Analyst Certification, designed to transform anyone into a world-class financial analyst.